The awning’s aluminum framework, other than the fasteners, is powder coated rather than wet painted in your choice of standard colors based on the model selected. The typical homeowner will select a frame color that best matches their home’s exterior trim color. 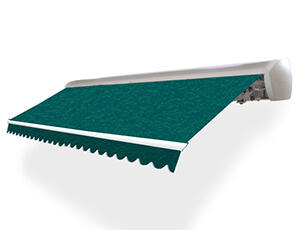 You have an option as to how you would like to operate your awning. Drive Side: Choose location of Manual Gear or Motor (right or left side of the awning). Determine left or right side when standing on your deck looking at the house. Manual Operation: The manual crank option requires you to turn a crank handle to extend and retract the unit. You will need to turn the crank approximately 70 times to extend a 10' projection unit - more for greater projections. Retracting the unit will take more effort than extending the unit as you are working against the outward force of the internal arm springs. Motorized Operation: Motorizing your unit will only require an outdoor outlet for power. The unit will operate with a remote control and will stop automatically when fully extended or fully retracted. When your unit is motorized you can also stop it in any position to best fit your needs. Our motors also have a built-in manual crank system so if you lose power you can still operate your awning. This option includes the power cord and remote. Optional Wind Sensor: This wireless sensor is mounted on the front bar and sends a single to the motor to retract the unit if it becomes too windy. The sensor offers an added level of protection to you investment. Length of the wand used to crank the awning manually open and closed. Supplied for free with both Manual and Motorized units. Choose from Small, Medium or Large.